Poor air quality is known to have significant economic and social impacts, including adverse health risks and a lower quality of life. In this post, we examine two examples of trans-border air pollution. We analyze the causes of poor air quality, and describe the strategies being adopted on either side of the Mexico-USA border to improve air quality. 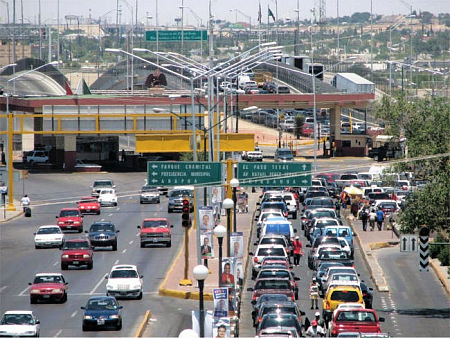 Does air pollution from maquiladoras in Ciudad Juárez affect people’s health? The worst air pollution along the USA–Mexico border is in Ciudad Juárez in Chihuahua, located across the Río Grande from the city of El Paso in Texas. It is often claimed that this is because of Mexican authorities’ poor enforcement of environmental laws and the high number of maquiladora firms operating in the city. Socio-economically poor areas are more affected by bad air quality than richer areas, but this is due to the precise location of the small-scale brick kilns, which have no pollution controls, rather than to the locations of maquiladora plants. Most of the city’s 350 brick kilns are in densely populated low-income residential neighborhoods such as Anapra, Division del Norte, Fronteriza Baja and Waterfill. When the kilns were first built, these areas were on the perimeter of the city, but they have since been enveloped by urban sprawl. The health damages arising from the brick kilns are estimated at almost $50 million a year in Ciudad Juárez and an additional $13.4 million a year in El Paso. How are the cross-border twin cities of Nogales (Sonora) and Nogales (Arizona) trying to improve their air quality? Further west, the border cities of Ambos Nogales (Both Nogales) share many of the same air quality issues as Ciudad Juárez. Nogales in Sonora has a population of about 250,000, more than ten times that of its cross-border twin in Arizona. Inevitably (given the size differential) most of the pollution, including dust and vehicle emissions, comes from south of the border. Air quality is also adversely impacted by natural hazards such as wildfires in the region. The air in Nogales, Arizona, regularly fails to meet the US Environmental Protection Agency’s limits for coarse particulate (PM10) pollution. However, now, according to a recent news report, steps are being taken to ameliorate the air pollution in Ambos Nogales by authorities either side of the border. On the Mexican side, reliable air quality monitoring systems are being installed, with the financial help of international agencies. The Sonoran state government has started a priority program to pave dirt roads in the vicinity of Nogales, responsible for an estimated 9,000 metric tons of dust each year. In the next phase, tighter controls are needed on factory emissions and on the burning of waste. On the US side, the Arizona Department of Environmental Quality is trying an innovative approach, using federal funds to pay Mexican truck owners to replace their old, leaky mufflers with state-of-the-art catalytic converters. Each conversion costs about $1600. The program should eventually reduce harmful emissions from the particle-spewing diesel-burning trucks by 30%. The next item on the agenda for the US side should be to reduce the waiting times for all trucks crossing the border, so that emissions are further reduced. We will look at the success (or failure) of these strategies to ameliorate trans-border air pollution in a future post.